Shoreline Marine Contracting is an authorized dealer for pre-fabricated docks by Pier Pleasure and Shorestation. 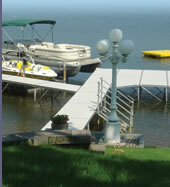 These docks offer the lakefront property owner a low maintenance option to lake access. We work with you to design the dock that meets your needs. Once the design is approved you are able to add a wide range of products to your dock from bumpers and benches to flagpoles and fishing aids. Check out the Pier Pleasure and Shorestation websites for more info.